STAMP A STACK CLASS THIS WEEK OR GRAB THE CLASS BY MAIL! It’s Birthday cards in our classes this week. We will make 6 cards. 3 each of 2 different designs. Join us in class or get the Class By Mail. WHEN: Friday 22nd February 10am or 7pm. CLASS BY MAIL: Order the card kit to create the 6 cards. Includes cut cardstock, embellishments and instruction. Stamped images not included but you can substitute with what you already have or order the stamps separately. Here is a sneak of one of the cards. Let me know ASAP to reserve your seat if you are coming to class. Email/comment if you would like the Class By Mail. cards, Catalogues, Christmas, Classes, Personal Ramblings, Stampin' Up! FROM OUR HOME TO YOURS – MERRY CHRISTMAS! Christmas is almost here! I wanted to take a moment to wish you a Very Merry Christmas from our home to yours. Thank you for joining with me in this fun stamping journey. I have loved sharing all my projects with you and I look forward to more sharing in the New Year. However you spend the day be safe and while under the tree might be full of gifts and treasures I hope you take time to think on the greatest treasure given to us in the gift of Jesus. The card above was made for my 12 Weeks of Christmas series but, well… I ran out of weeks to share it. It’s a great opportunity to share it with you now for my Christmas wishes to you. Made with the Farmhouse Christmas Bundle which is sadly not being carried over, I wanted to show that you can use this set without having to colour it all the time. I stamped the house a number of times over the Crumb Cake card base. The paper is from Under The Mistletoe DSP. You can stamp directly on to the silver Foil but remember to use Stazon. BACK TO BASICS CARDMAKING CLASS THIS WEEK! Do you know someone who would like to learn to stamp and make cards OR perhaps it’s been a while and you have lost your MOJO. We are getting Back To Basics this week. In this class we will talk about stamps, inks and paper. We will go through some tips to help you get the best results when you stamp. We will also create 2 cards. WHEN: Friday 31st August 7pm or Saturday 1st Sept. 2pm. Cost: $15 RSVP: Thurs. 30th August. This is one of the cards we will make. Do you know someone who might like to try this? Please pass on the details to them. Are you feeling a little lost in stamping yourself? Why not join us. Please RSVP by Thursday 30th by emailing me at jghayward@yahoo.com or commenting here and I will get back to you. WATERCOLOURED LAKE WITH THE WATERFRONT! Continuing on with Watercoloured landscapes scenes I have this card to share with you. This card is one we will be doing at classes this weekend but I thought I would share it with you. I found this landscape scene on Pinterest and thought I would try to recreate it. See what you think of the card with the original photo?? I used the Waterfront set to create the mountains and land and stamped the trees. The lake and the sky are watercoloured with the Inkpads and Aquapainter. I kept the card simple. With these cards you don’t want to cover up all the scene with a big sentiment or lots of fuss. The sentiment is from Sprinkles of Life. I will be back tomorrow though with another card. This one is back to some simple stamping with the set. 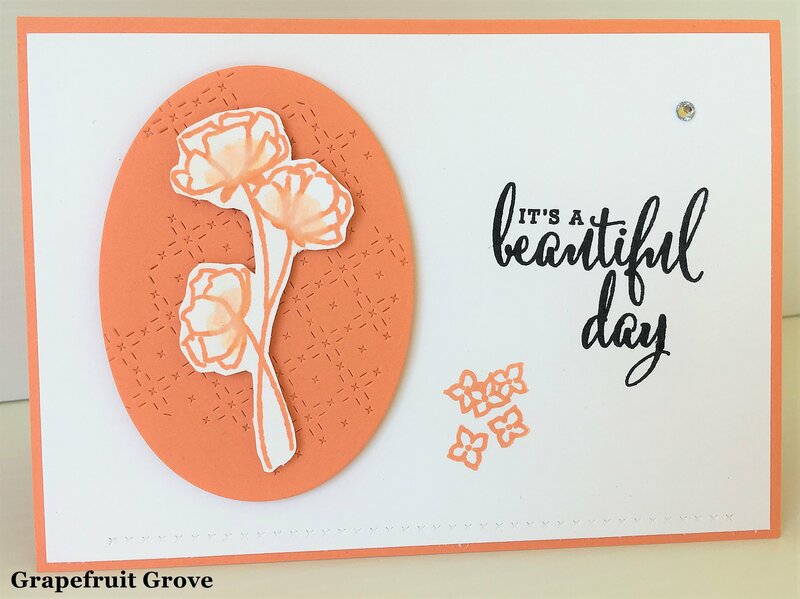 cards, Classes, Online events, Stampin' Up! I forgot to show you some Thank You cards I have made recently for customers and team members. These are all little 10cmx10cm (4″x4″) cards. I like making these size cards. This first one uses the Vertical Greetings set. I don’t use this set nearly as much as I should. It is so cute. I coloured the stamps with the markers to get the different colours. One heart version was in Sweet Sugarplum and the other heart version was in Flirty Flamingo. A little Linen Thread bow finished them off. These cards where made for my customers a couple of months ago. Yes it has taken this long to show you. This next little cutie card using the Baby Bear stamp set was for some of my team members for an online team event we had last month. I wanted to send out a “Thanks” for them sharing in the Facebook group event. Side Note: Hey! Have you considered joining Stampin’ Up!?? Not just for the discount (although that’s great!) but for all the team fun and the sharing and the creating and the …. Really, so many reasons why! Let me know if you would like more information or stop by my page on this blog for “join my team”. See the link at the top of my blog. This Thank You card was for a challenge on my Facebook page I held last month to share a card that my readers have made and I sent out a prize at random. The card was made up with some “bits” I had on my desk from another project. They come in handy sometimes. This one was using Happy Birthday Gorgeous set. Have a great day and for all my US blog readers wishing you a Happy Thanksgiving. Enjoy the special celebrations. We don’t celebrate Thanksgiving in Australia but I think it’s great to take some time and be Thankful for all that we have. EXTRAVAGANZA SALE THIS WEEK STARTING WITH A 24 HOUR SALE! Other listed items are from 20th – 26th November. See what is on offer for the 24 hour sale below. But you can see these and all the other items for the rest of the week on the PDF document or head to my store on Monday. ** TO ORDER: Receive a small bonus gift from me to Say THANKS. I do appreciate your orders. 🙂 Australian Residents only. Order Directly from me. Orders for the 24 hour sale on Monday must be to me by 8pm. So now grab a cuppa and head to view the list. The page numbers are listed so you can view them in the catalogue. Please ask me if you have any questions. WATCH IT WEDNESDAY STARTS TODAY! Starting today I have a new segment on my blog: Watch It Wednesday! Each Wednesday I am going to bring you a video. It might be of a cool stamping technique, a new card or helpful tips on Stampin’ Up! Products. They might be from Stampin’ Up! or myself or ones I have seen on my blog travels that I thought I would share with you. So watch out each Wednesday. Be sure to subscribe to my blog so you don’t miss any. You can find the link in the right side bar. Today’s first edition of Watch It Wednesday. What do you think?? What that helpful? Card Class is on this Friday 18th August 10am and 7pm. Come join in if you are a Wollongong local. I have 3 great projects to share with you using the Carols of Christmas bundle. This is one of the cards we will be making which was featured last week on my blog. $85 which includes the Carols of Christmas bundle (in clear mount) and class greatly reduced in price at $7!! PLEASE RSVP by Wednesday 16th.